The chef’s uniform is a classic: those double breasted white chef coats and plumed hats have been around since the mid-nineteenth century — and haven’t changed much since. There’s no doubt that most restaurants require their hosts and wait staff to wear neatly tailored uniforms. But uniforms are just as essential for the people behind the scenes, cookin’ in the kitchen. – Protect against burns that might occur from boiling liquids and hot food items. – Safeguard the body from heat put off from ovens, grills, pots, and pans. – Keep the chef’s non-work attire protected from stains and spills. – Maintain hygienic food practices by providing a clean, protective covering. – Give off a professional, commercial image and uphold the tradition of the uniform. To ensure hygienic practices, chef uniforms should not be worn in public and should be changed at least once a day, being washed and pressed before repeat wear. A professional laundering service can take care of this aspect of uniform maintenance for your restaurant and its workers, thoroughly cleaning garments and returning them each week to employees. Lord Baltimore Uniform in Baltimore, Maryland can provide that service, and offers chef uniforms for both rental and purchase to the Maryland, Washington, DC, Virginia, and Pennsylvania areas. 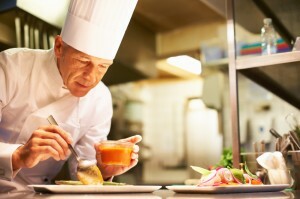 We’ll keep your chefs dishing up great food in the kitchen with our professional chef uniforms. To learn more about our products and services, please contact Joe Bateman at Lord Baltimore Uniform & Linen Rental by calling 1-800-292-1224, or visit our website today! This entry was posted on Wednesday, March 20th, 2013	at 6:42 pm	. You can follow any responses to this entry through the RSS 2.0	feed. Both comments and pings are currently closed.